A Tropic in GTA Vice City. The Tropic is a large drivable boat in Grand Theft Auto: Vice City, Grand Theft Auto: San Andreas, Grand Theft Auto: Vice City Stories, Grand Theft Auto IV and Grand Theft Auto V.
"Deep sea boat. Excellent seafaring craft. Believed to be used to aid disposal." 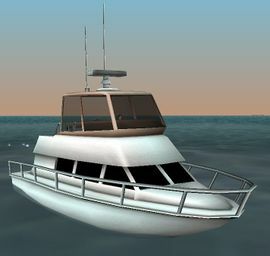 Earlier iterations of the Tropic prior to GTA IV are essentially flybridge motor yachts or cabin cruisers, evidently featuring living space on the lower compartment of the boat and a partially covered bridge on top; in GTA Vice City and GTA Vice City Stories, a small kitchen is visible from the door in the back, while in GTA San Andreas, the front windows are semi-transparent, allowing the player to see a small living area with red curtains, tables and two sofas. The Tropic in GTA Vice City Stories, however, is sharply reduced in height, with its top chopped and featuring an open flybridge. It is also one of the boats wanted by the Civil Asset Forfeiture Impound for export in GTA Vice City Stories. GTA San Andreas (Rear view). The entrance to the interior of the Tropic. The interior of the Tropic in GTA San Andreas. In GTA IV, the Tropic is still a cabin cruiser but has a low-profile cabin housed in its bulky hull, similar to a Bayliner Cruiser. As the boat is reduced to a size smaller than even the Jetmax or Squalo, the title of largest boat now belongs to the Tug Boat, which is easily twice the size of the pre-GTA IV Tropic. A sheltered variant with a forward-swept spoiler, with a glass fairing and a canvas canopy attached in the back. A basic "bare bone" Tropic in GTA IV. Four other variants of the GTA IV Tropic, with increasingly more fittings. The Tropic in GTA V, from a leaked TV show. A Tropic in GTA V.
Being large, the Tropic between GTA Vice City and GTA Vice City Stories is generally one of the slowest of all boats (in a similar level as the Marquis and Rio) due to its size and weight. The GTA IV rendition features improved performance, and is surprisingly capable of beating the Jetmax and Squalo in terms of top speed (being capable of reaching over 51mph/80 km/h) and acceleration. The boat is also substantially more maneuverable given its moderately light weight and smaller size. In GTA San Andreas, there is a visual effect glitch that has Carl go into an "invisible chair" sitting position for one second as he changes the radio station. This happens because the Tropic uses the same animations for changing the radio station as normal cars and boats with seats. This also happens on the Dinghy. In GTA San Andreas, there is a glitch that if the player moves the character up into the cabin (where you sit and drive the boat), you can see completely underwater without any visual deterrents. In GTA San Andreas, the vehicle automatically plays K-JAH West upon entry. Docked on eastern side of the Leaf Links-Vice Point canal, west of the Links View Apartment. Spawns underneath the Garver Bridge, next to a Squalo. Docked at the Ocean Bay Marina in Ocean Beach, at the middle dock. Docked at a pier in the northern part of Starfish Island. This page was last modified on 11 October 2014, at 11:24.